eCheck is a very simple payment method used for transferring funds from a player's checking account to an online casino account. This process involves normal banking channels but without any paper instrument through the channel. It is an instantaneous way of transfer as it is carried out electronically. eCheck functions similar to an ordinary paper check with the only difference that the eCheck instructions are given electronically. Much the same as a paper checks, the eCheck can be used only if there are funds on the checking account, which is different from a credit card functions as they allow players to transfer funds to online casinos even if there is no money available at the checking account. 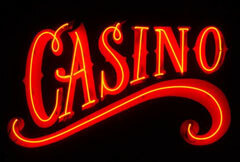 The process of depositing money to the online casino account through the eChecks is quite simple and clear: a player choose Deposit option and eCheck payment method at the online casino banking page, then enter the bank account number, the amount of money for funding and make the transaction. Note that everything will work successfully if the selected amount of money is smaller than that in the bank account. Bu what about withdrawing funds? Is it as easy as depositing? Yes. The difference is that this time a player should chose eChecks as the withdrawal rather than the deposit method. Are the eChecks secure enough? eCheck is a more secure way of funds transferring, as it offers an added measure of security. Let's look closer at the system of funding online casino account with the help of eCheck. It is a bit different form that we used to deal with using the ordinary paper checks. The main difference is that the player's bank communicates with the online casino during the transaction process and if the latter is not secure enough, it will not get the money. This check is performed automatically by the bank in a more comprehensive way than it could be done by a player. This is a key to security. One of the key advantages of eChecks is that US players can make use of this payment option as well as gamblers outside the United States. American online players are in difficult situation as they face constraints on what online casinos to play. Moreover, the variety payment methods are limited to them. That is why, the US gamblers are fond of the eChecks. Another advantage of the eCheck payment method is that it is free and has no additional fees or chargers. The only request for players is to have a checking account with money on it and access to an online casino that accepts eChecks as a payment option. Are there any other advantages? Yes, instant money transfers. It means eChecks allow instant funding, apart from withdrawals as they can take up to 7 business days. Everything in the world has two sides and the eChecks are not the exception. The main disadvantage of this simple and pleasant payment method is that it is available at few online casinos. Another inconvenience is that the checking account must be opened in the currency of the country in which a gambler lives. Nevertheless, if a bank has a currency converting option it is not a problem at all. In today's fast-growing and fast-changing e-gaming world the use of eChecks is increasing rapidly, as it is one of the easiest as well as the safest payment method.